Here they are - the Six Day Socks in all their glory. This stripe is called Pocket Full of Posies, and it's from a Vesper club release which means I'm pretty much just tormenting you here. There's no guarantee of any of the Vesper club yarns making it into the regular rotation at Knitterly Things, but if this one turns up, I can highly recommend it. I would love to know why I'm so particularly smitten with these socks. It may be the colours, which taken individually do nothing extraordinary for me but combined, seem to fill me with both peace and enthusiasm. Or it may be the quality of the stitches, born of hours of nonstop autopilot knitting as I watched Bleak House and, later, listened to a series of Georgette Heyer audiobooks. Look closely and you'll see a very slight texture resulting from each stitch being turned just a little as it was worked - a purely unconscious pattern. Regardless, I am absolutely mad for these socks. It probably helped that we had sun happening on the day I had time to photograph them - so cheering in the midst of our horrible, mostly grey winter - but this pair seem to be insanely photogenic as well. You wouldn't think this about socks. I mean, they're socks, there's nothing about them that could look weird. But if the angle is strange or the light is bad or it's absolutely freezing outside such that your legs are seizing up, you can get some very weird photographs indeed. Unless, apparently, you are taking pictures of the Posies. They just kept looking nice. 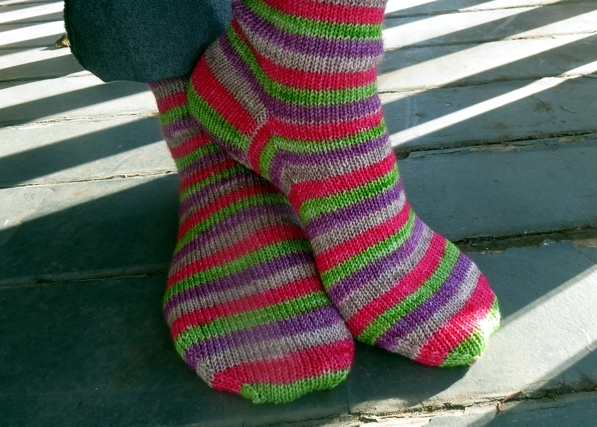 And like all the Vesper socks - so comfortable. What about you - do you have a guaranteed-perfection project of choice? 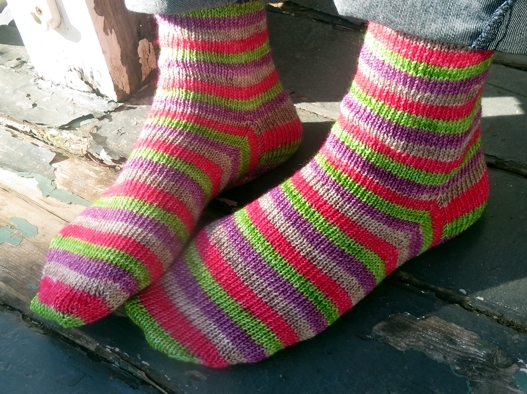 I have been knitting lots and lots of socks lately. They seem to be the "thing" for me right now. But I'm also fascinated with blankets. Just don't know if I have the fortitude to stick to the end! UNLESS - I weave a lot of strips and stitch them together. I think about that a lot too. I finished a sock yarn scrap blanket last week...I'd been working on it a little bit each day for a year. I started a blanket for Elizabeth when we were traveling to see my dad, but haven't been back in a while. I'm trying to save that as my "cheer up" for those trips. But...since she's graduating in 2 months, I should probably get it out and see if I can finish it. I find that I like the blankets if I can switch the colors up a lot or the stitches...either or both is fine with me, so lots of scrappy looking things will be hanging about my house one day! Oh man Leslie, and here I am hoarding my sock scraps for scrappy socks! !